Contact the church office at (402) 483-2213 or by email . Jean Helms is our Administrative Director and she will be happy to answer any questions that you may have about our church facilities. The Auditorium pictured above is a versatile space which can seat up to 200 in rows and up to 120 seated around tables. The Church office keeps a list of community ministers who would be happy to work with families or individuals to help celebrate or commemorate major life passages like marriages, child dedications and memorial services. Please read our rental policy and contact the church office at (402) 483-2213 or by email to check availability of our facility for your event. A tour of the building may be arranged with a minimum one-week notice. 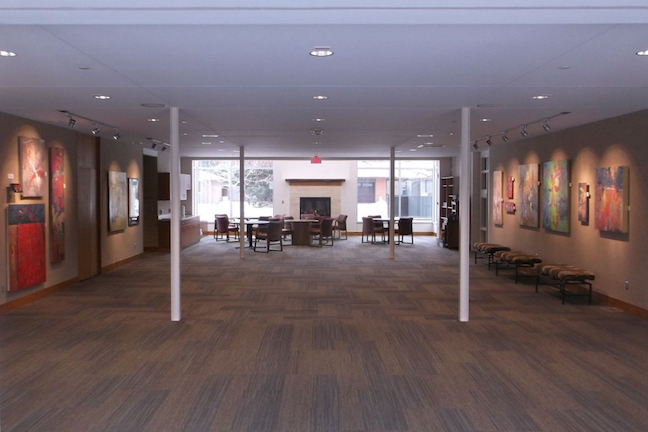 A beautifully lit room near the kitchen features a fireplace, cafe seating, bookstore and Art Gallery. 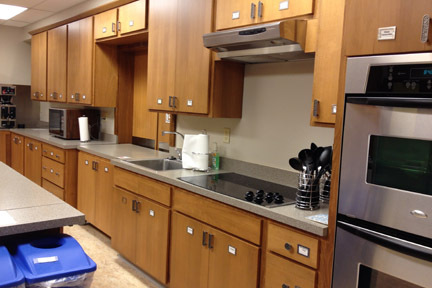 Our kitchen offers commercial refrigerators, dual stove and an energy-efficient dishwasher. A beautiful Baldwin piano and excellent acoustics create an outstanding recital venue.